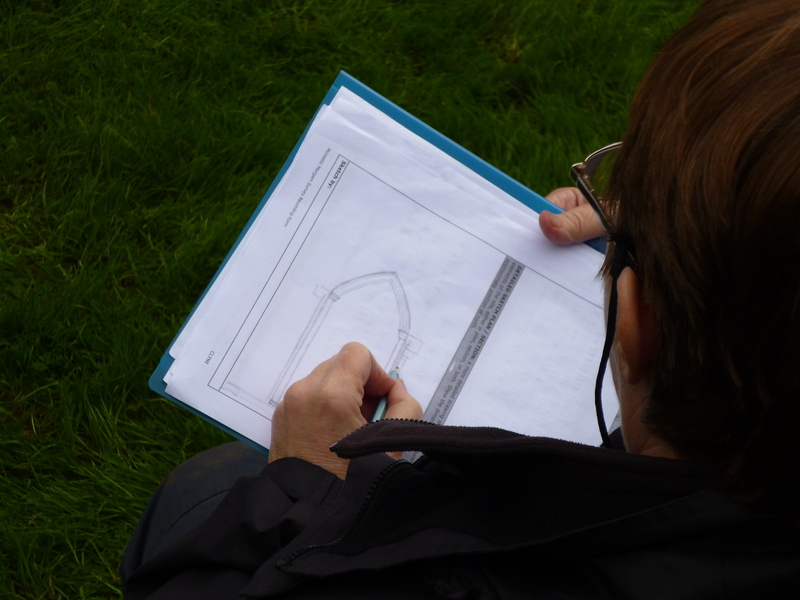 We have had a hectic last few days of the second week of the Monastic Margam project. Wednesday we were hit by the bad weather which slowed down the recording of the abbey ruins, we spent about an hour huddling in the tent waiting for the rain to ease. Eventually we were able to venture outside and continue recording. 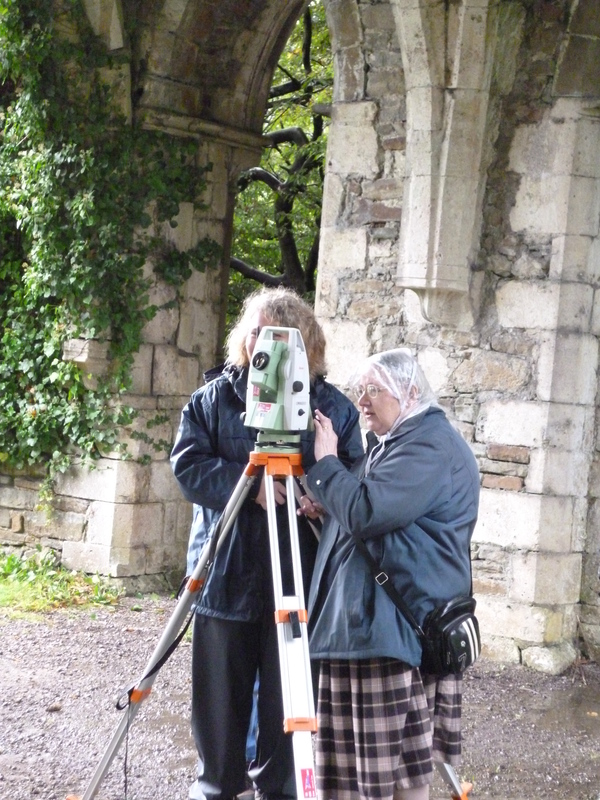 It was decided to move the total station under vaulted remains of the east cloister and continue to record here, so that we were sheltered from most of the rain. 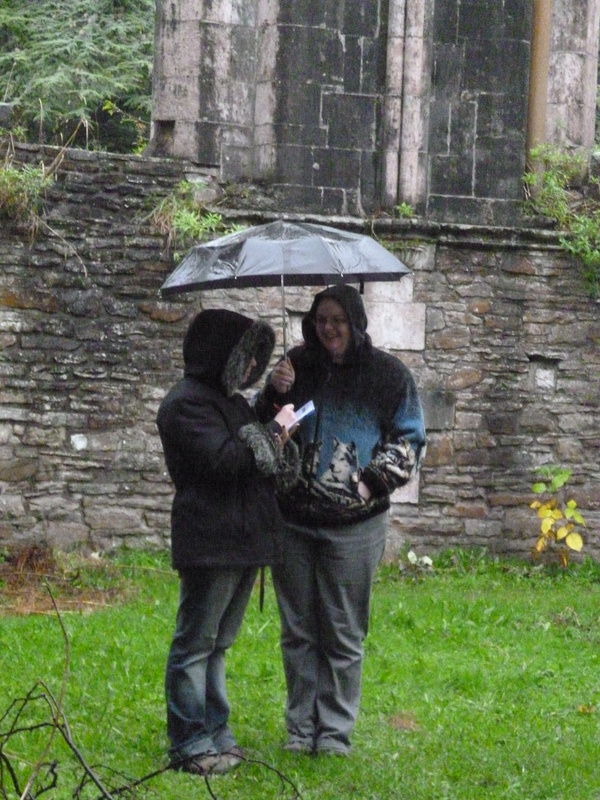 Unfortunately, for two of our volunteers Sarah and Ruth, who were doing the photographic survey, they had to continue to record the interior of the Chapter house in the rain! They did a brilliant job recording in poor conditions using an umbrella to shelter them as best they could and were able to finish recording the interior of the Chapter house by the end of the day. Thursday was a very busy day. As well as the recording of the abbey we also received a visit from Neath-Port Talbot council who came to see what we were doing and the condition of the abbey remains to discuss what measures they could put into place. The meeting was very positive and they seemed very concerned with the condition that the abbey was in and the danger that it might present to the public. We were also visited by members of the University of the Third Age from Porthcawl. 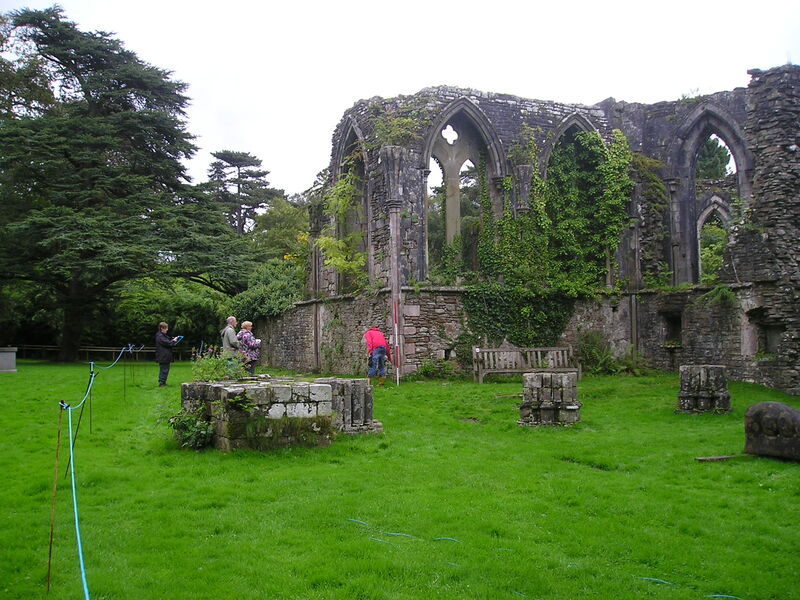 They had heard about the project from one of our volunteers and were also surprised with the condition the abbey was in but they were happy to see something was being done and they seemed to enjoy the visit. On the recording side we have using the total station surveyed the partial remains of the Nave/North Cloister wall and we have continued to survey the vaulted area of the East Cloister/Vestibule that we began surveying on Wednesday. With the photographic survey we have moved on to recording the features in the vaulted east cloister. On Friday we were able to see just how far we had progressed with the project and how much there was still left to do. The volunteers had recorded the outside of what would have been the former Sacristy and the central columns of the vaulting in the East Cloister and we hope to record the interior of the Chapter House on Monday. On the photographic side the volunteers had started to record the interior face of the West wall of the East Cloister and it is hoped that by the middle of next week we will start to record the remains of the under croft to the south of the Chapter House. The start to the second week of the project has been really encouraging. On Monday the weather was kind to us, as unlike the rest of South Wales it did not rain in Margam. However, it was windy and we had to wrestle with the tent that Dr Evans brought down for us last week, as it threatened to blow away in the wind with us in it! We were able to survey using the total station the internal wall of the chancel and the remaining internal walls of the south transept where a side chapel would have been. We were able to get some good detail on these walls, recording the two recesses in the wall that would have served as a small alter.These recesses were described by one of the volunteers as looking like pizza ovens. On the photography front we began to survey the external face of the chapter house entrance and began to record the internal walls of the chapter house. We had some extra help with the photography in the afternoon with one of our volunteers, scheduled help out next week turning up! On Tuesday the good spell of weather we had had on Monday and the previous week had ended and we arrived on site in the rain. Luckily the rain stopped shortly after and held off for most of the day. We were also sharing the Margam Park and the Orangery Car park with a film company, filming for a new T.V. series called Da Vinci’s Deamons. They were filming at the castle and did not interfere with the recording, however it did spark some interesting conversations at lunch. Just after the lunch break we were visited by a photographer form the Evening Post who took photos of Rowena and myself working and a group photo with the volunteers. On the project front we continued to photograph the internal wall faces of the chapter house and record the extent of the damage. With a fantastic effort from the volunteers we have have almost finished the recording the inside of the chapter house and will be moving on to the vaulted remains of the east cloister/vestibule walls. We have also moved on with the total station recording, the arches of the vestibule and the internal face of a small section of the nave wall have been surveyed in. We were able to put in another survey peg before the end of the day ready to survey the outer face of the east cloister wall tomorrow. The day ended a little early today as unfortunately the heavens opened with half an hour left so we decided to call it a day. One big positive from last week and the start of the week is the enthusiasm the volunteers have shown and any chance to volunteer for extra days have been snapped up immediately. I went out this afternoon to see how the team is getting on, and to take out the gazebo with a table and chairs so they had something more convenient than the ruins to keep the rain off the notes. Sam showed me the photos they’ve taken so far, which look fine. I was able to answer some of the questions about the way the buildings relate to each other, and provide some technical vocabulary! Hello, my name is Sam Pamment trainee community archaeologist at GGAT and along with Project Officer Rowena Hart we are running the Monastic Margam survey project at Margam Park. 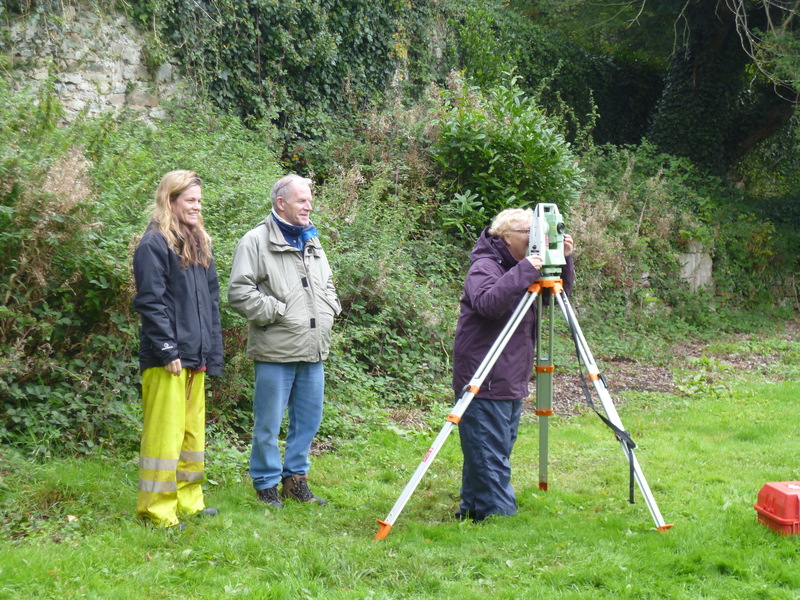 We are here for 3 weeks to record the standing remains of the abbey using a total station to create an outline of the abbey walls and a photo survey to highlight the areas of substantial damage to the remains and the threats to the abbey remains. It has been a great first week at Margam, with decent weather and fantastic help from local volunteers and the Friends of Margam Park we have been able to survey a large portion of the outside walls of the abbey remains. We have had a good laugh with the volunteers, who have been very enthusiastic and willing to learn. The project almost had a celebrity visitor this week, Martin Clunes was rumored to be at the park. Unfortunately, he did not come down to the abbey to see us at work much to my disappointment! We have had such a fantastic first week and have made good progress, I am hoping the next two weeks will be just as good. If you are interested in the project and would like to find out more we will be at Margam every week day until the 5th October from 9.30am – 4.30pm or you can follow us here with more updates on the project over the next two weeks.